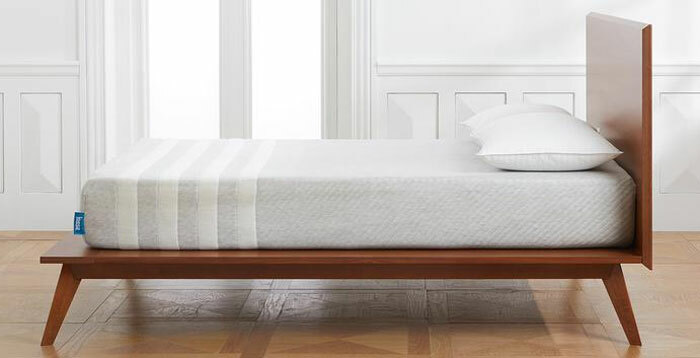 In our Leesa mattress review 2019, we shall examine the various properties of this mattress which will help you find if it is right for you. The Leesa mattress is a 3-layer 10-inch thick mattress most suitable for those of below to slightly above average weight. If your weight is particularly high, then this mattress may be just a bit too soft for you. Let’s have a closer look at what the Leesa mattress has to offer. Who Would Like the Leesa Mattress? First, how the mattress is constructed and details of the properties of each of the three different layers. The top layer (comfort layer) comprises 2 inches of LSA200 Polyfoam. This is a proprietary foam that is a bit like latex but more responsive than latex. It offers a reasonable level of bounce which young couples would like, while also keeping you cool during the night. This foam offers good air flow, and when combined with the inverted ‘egg crate’ design it is almost sure to keep you sleeping a bit cooler than on most latex mattresses. Beneath the bouncy cooling layer of the Leesa mattress is a 2-inch layer of memory foam. The memory foam layer has been placed below the latex layer because memory foam can tend to keep you hot at night (temperature-wise!). Placing it beneath the LSA200 foam layer avoids overheating, and helps keep you cool during the night. When you lie on the Leesa mattress, your weight will pass through the top 2-inch layer and then meet the memory foam. 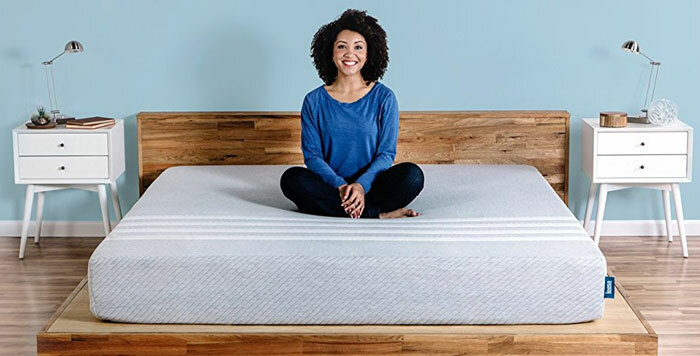 You will be able to enjoy the properties of memory foam without feeling stuck in the mattress – as some memory foams can do. The bottom layer is a 6-inch layer of high density polyurethane foam. This provides the support when you lie on the mattress. The two layers above have very little support, because they have been designed to provide bounce, comfort, and cooling. The poly foam base layer provides the support. It also provides durability so the Leesa mattress will last for longer than without it. This construction keeps you comfortable and cool while sleeping, while also supporting your body irrespective of your sleeping position. The Leesa mattress is suitable for all types of a sleeper – side, back or belly sleepers. Back Sleepers: Some may think that the relatively thin 2-inch layers of comfort foam might not appear to be thick enough to make much difference to your comfort. This is not the case! Back sleepers will find that the two layers of 2-inch thick foam supports their lower back, while the upper back/shoulders and hips/buttocks sink into it. The bottom support layer offers support to the shoulders and hips, while the lower/lumbar part of your spine gets support from the top two layers. (Check our FAQ Section at the end). Stomach Sleepers: In the same way as the Leesa mattress support back sleepers, the chest, belly, and knees of stomach sleepers are also supported. Most pressure on your mattress comes from your chest. If you are big-bellied it will also come from there. Again, the 4-inches of softer foam will allow these pressure areas to sink down to the support foam, while the comfort foams will envelop the less prominent parts of your anatomy. One issue with stomach sleepers can be arching of their spine – we found no such issue with the Leesa mattress. Side Sleepers: For those that sleep on their sides, the major pressure points are the shoulders, hips and perhaps also the elbows and knees. The memory foam layer seemed to absorb the pressure from the hips and shoulders. 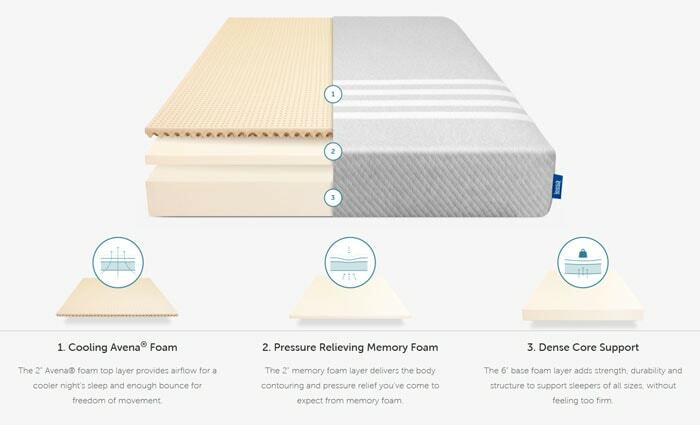 The design of the Leesa mattress will allow these areas to sink into the top two layers and then be supported by the high density poly foam at the bottom. Sleeping Position Conclusion: What the Leesa mattress achieves is to average the pressure over your whole body, no matter what sleeping position you prefer. The upper layers support the pressure points enough for them to sink down to the support foam level, while those areas of your body needing less support are contained by the two top layers. The term ‘motion transfer’ relates the effect of the movement of one partner in a bed on the other. When one moves, this movement can be transferred by the mattress and disturb the sleep of the other – if not waken them! Such movements can be one partner getting into bed later than the other or arising earlier in the morning. They could toss and turn during the night and upset their partner. While dropping weights onto the mattress can give some indication, it is always best to use real life conditions. While carrying out tests for our Leesa mattress review 2019, we found that this mattress absorbs the majority of the movement between sleeping partners. The motion transfer of the Leesa mattress is no greater than the majority of mattresses and better than most of that majority. Most people fail to consider edge support when buying a mattress. In our Leesa mattress review 2019, we take everything into consideration. That includes how easy it would be for you to sit on the edge of your mattress. Many people use their mattress as a seat when putting their socks and shoes on. It can be an important aspect of a mattress to many people. However, even more importantly, if you are sleeping with a partner then you might have to use the entire surface of your mattress, including the edge. Even when getting into the bed at night most people sit on the edge then swing their body over onto the mattress. Edge support is not a common thing for most people to consider when they purchase a mattress. Nevertheless, it is important to us. The Leesa mattress does not appear to be particularly designed for good edge support. Nevertheless, while it does compress slightly when you sit on the edge, it does tend to support you when you lie on it. It does not tend to drop you out of the bed when you lie on the edge as some mattresses do, but supports you to an extent – at least enough for you to move slightly back onto the main part of the mattress. Here are the extras that many people fail to check on when buying a mattress. They are very important, yet many fail to check up on them until after purchasing. Trial Period: You get a 100 night sleep trial with the Leesa mattress. If you don’t like the mattress during your 100-night trial period, simply return it free for a full refund. Warranty: You get a 10-year limited warranty. Check the terms before making payment. CertiPUR-US® Certified: Manufactured without ozone depleters, phthalates, heavy metals and other toxic substances. Can be used with adjustable bases. Social Impact Initiatives: The firm donates a bed to somebody in need for every 10 mattresses sold. Trees are also planted for each item sold. If you sleep in a number of different sleeping positions: On your back, your side and/or on your stomach. The Leesa mattress is suitable for all these different sleeping positions, so is ideal for those that use more than one position at night. You like a comfortable top to your mattress. The Leesa mattress is very comfortable to sleep on. You like to stay cool when you are sleeping and not wake up sweating or hot during the night. You are particularly heavy or overweight. The mattress might not support you enough. You prefer innerspring or a plush top: The Leesa mattress has bounce, but the same as an innerspring mattress. You prefer a 100% memory foam mattress. The Leesa is a great mattress, but cannot offer the same benefits as the $1000+ Tempur-Pedic. Here are some questions we have been asked regarding the Leesa Mattress, and our answers to them. 1. Why is the shape of the spine important when lying on a mattress? Your spine has a specific shape to it that nature designed as the best shape to support the rest of your body. Your spine supports your entire body, and your entire skeletal structure depends on your spine since they are all connected to it. a) Front and back view: if you view your spine from the front or back, it is ramrod straight, top to bottom. If you sleep on your side, your shoulders and hips take most of the pressure. If the central part of your spine between these two areas is not supported, then it can sag. That means your spine is not straight from the top of your neck to the coccyx at the base. This can and does, lead to severe orthopedic problems. b) Side view: When viewed from the side, your spine is in an elongated ‘S’ shape. If you sleep on your back or your stomach, the bottom curve of the ‘S’, created at the small of your back, will tend to level out – again leading to severe back pain and orthopedic issues. Each of these problems can be avoided by sleeping on a mattress that provides comfort in the top level, but a strong hard base below that. The comfort level of two layers of 2-inch foam offers support for the spine while the denser 6-inch support layer provides support for the pressure points. 2. Would the Leesa Mattress be suitable for my partner and me? I am 125 lb and he is 234 lb. The Leesa mattress should certainly work better than an innerspring or regular latex mattress. However, because of the big difference in weights between you and your partner, we suggest a good memory foam mattress. These are excellent for movement separation. Check out our memory foam reviews here. 3. The total of 4-inches of comfort and memory foam doesn’t seem much. Does this really provide the benefits you claim for it? Yes, it does! It is not meant to be a memory foam mattress, but one that offers good comfort and support for people who sleep in a number of sleeping positions. You may sleep on your side and your partner on their back or stomach. The Leesa Mattress is suitable for both of you so long as there is not a huge difference in body weights between you both. The 4-inches are more than enough to support your partner’s spine at the small of their back while their hips/buttocks and shoulders are supported by the higher density foam 4 inches lower. The same for you on your side. Your shoulders and hips sink into the 4-inches of soft foam onto the harder foam, while your side is supported by the softer layers. 4. What is LSA200™ Foam? Initially, the Leesa mattress was made using a foam known as AvenaTM foam. This was also a latex-like high resilience foam, but Leesa has changed it for 2019: The top comfort layer is now made using a similar foam known as LSA200TM. This gives a plusher feel to the mattress than Avena, although we cannot say how it is made for legal reasons. It has similar properties to latex only it is cooler and more resilient with better spring or bounce. LSA200TM foam is not only more comfortable, but provides better pressure relief than the AvenaTM foam. It contours to your body shape more quickly, and the Leesa mattress now has more comfort and pressure relief than before. It is also better for side sleepers than the original mattress. It is also more durable than the AvenaTM version. The change was made in September 2018. It feels like latex, but has greater tear resistance than latex. In this Leesa Mattress review, we have discussed how you can find if it is right for you, or if you need something different. We have discussed the pros and cons of the Leesa mattress and explained how its construction is best suited to certain types of a sleeper. We have also answered some questions asked of us. Please contact us if you need further information on this or any other type of mattress. We have also explained the change made from the original AvenaTM foam to the new LSA200TM foam in September, 2018.